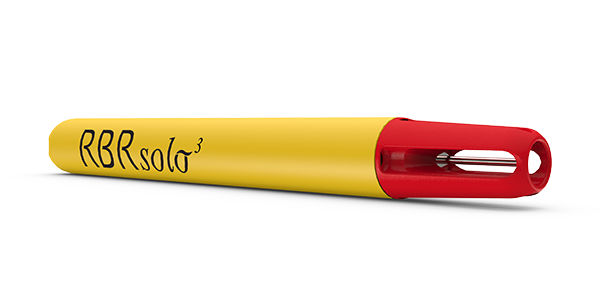 Our most compact, lightweight, and versatile single channel temperature logger. The RBRsolo³ T is one of RBR’s most compact, lightweight and versatile single channel recorders. Its small compact size lends itself to various applications from mooring, bore holes, profiling, or towed arrays. This single channel submersible temperature logger is ideal for long term deployments, harsh environments or anywhere where size is a concern. No other temperature logger on the market combines this level of accuracy with the ability to record 30M readings on a single battery. The fast sampling option provides the additional capability to sample at 2Hz, 4, 16, and 32Hz. 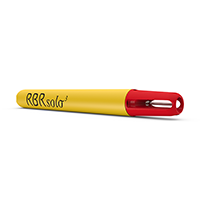 The RBRsolo³ T is calibrated to an accuracy of ±0.002ºC (ITS-90 and NIST traceable standards). The standard thermistor has a time constant of approximately one second (100ms for the fast thermistor option). The RBRsolo³ T has a measurement range of -5°C to +35°C in its standard calibration. However, it can be calibrated from -40°C to +50°C. The housing has a depth rating of 1700m, whereas the RBRsolo³ T|deep can go up to 10km deep.